Next Friday, I will return home to the United States. 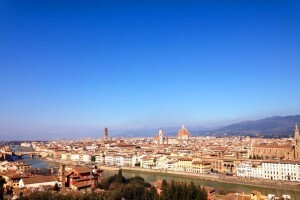 It’s crazy to think that I have been living in Florence for four months now and Florence is now my home. I’m not sure when the transition happened from a city in Italy to becoming my home but I am in love with everything about this city. 1. Realize that you will be studying in the best city in the world! Florence is the best of both worlds: it contains an incredible amount of history, is considered a large city but has a small city feel. You can walk anywhere in the city center within 30 minutes. 2. Understand that studying abroad in Italy means you will be eating a lot of excellent food. Pasta, pizza and gelato means lots of carbs. Understand also that you may gain some weight. You’re only in Italy once, so eat up and ignore the pounds until you come home. 3. With that in mind enjoy the amazing gelato. Ignore the heaping mounds of gelato. This stuff is never fresh. Instead, go to Gelateria dei Neri. It is by far my favorite gelato place in Florence and the only one I go to. I would definently recommend their Frutti di Bosco flavor. It’s the best! 4. Head up to Piazzale Michelangelo with a bottle of good chianti wine and enjoy the picturesque sunset. 5. Take an art class while abroad in Florence. I am a chemistry major but decided to take an art history class while I was there. It was by far my favorite class while I studied abroad. Something about studying art in the birthplace of the Renaissance. 6. In need of some grass (because Florence lacks this) or some relaxation in a park? Head to Boboli gardens, explore the gardens and find a quiet place to relax. 7. For dinner, try out MastroCiliegia, a restaurant near Lion’s Fountain. It was one of my favorite restaurants to go to while I studied there. Everything I’ve had there has been delicious. Try out the pear ravioli or their house dish pasta which comes in a homemade bread bowl. 8. Go to a Fiorentina soccer game. Soccer is a huge part of Italian culture, so go watch a game at the local stadium. 9. Climb the Duomo. This is a must if you’re studying in Florence. The view will be worth the 463 steps. I promise. 10. Explore the city. When you’re in bed one day and watching Netflix (because you already figured out that you can use Hola via Google Chrome to stream it), get up and go explore the city. Walk around, get yourself lost in the city that you soon will be calling home. Have the time of your life in the most beautiful city in the world.